“Right now we’re just chipping away,” said Miami-Dade Police Director Juan Perez. 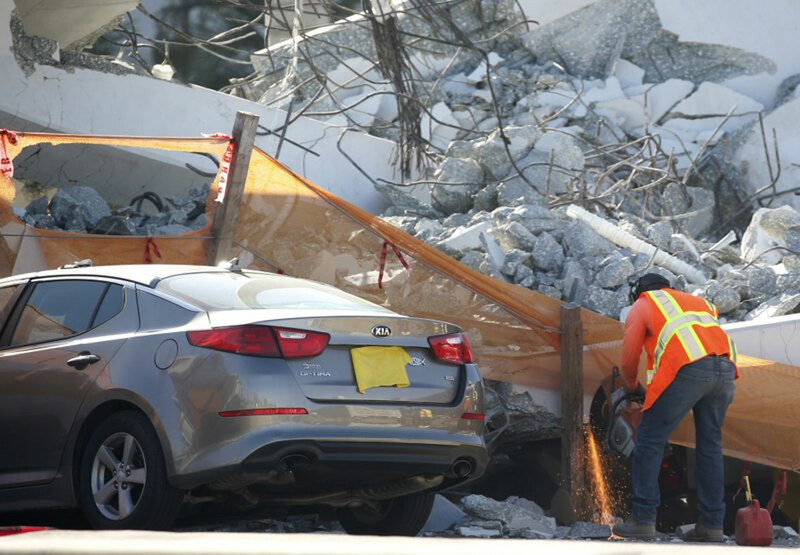 Authorities said Friday that cables supporting a pedestrian bridge under construction in Florida were being tightened following a “stress test” when the 950-ton concrete span collapsed over traffic, killing at least six people, injuring 10 others and flattening an untold number of cars. Officials expected to find more bodies in the rubble. People who haven’t heard from their loved ones congregated near the scene. An engineer left a voicemail two days before the collapse to say some cracking had been found at one end of the concrete span, but the voicemail wasn’t picked up until after the collapse, Florida Department of Transportation officials said Friday. On Saturday, FIU released a statement saying representatives from the university and DOT met with a FIGG engineer for two hours Thursday morning to discuss the cracking and determined there wasn’t a safety issue. The bridge fell soon afterward. Jorge and Carol Fraga drove from West Palm Beach, fearing their relative’s car was trapped beneath the bridge at Florida International University. Sixty-year-old Rolando Fraga, Jorge’s uncle, lives in the area and frequently takes the nearby turnpike to work, but no one has heard from him since mid-day Thursday. The $14.2 million project was supposed to be a hallmark of the faster, cheaper and less risky method of bridge-building promoted by the university. Slated to open in 2019, it would have provided safe passage over a canal and six lanes of traffic, and created a showpiece architectural feature connecting the FIU campus and the community of Sweetwater, where many students live. Relatives of those missing following Thursday’s pedestrian bridge collapse in Miami are anxiously waiting to hear whether their loved ones are safe and alive. As state and federal investigators worked to determine why the five-day-old span failed, Florida politicians pointed to the stress test and loosened cables as possible factors, and a police chief asked everyone not to jump to conclusions. On Twitter, Miami-Dade Police asked people to contact the homicide bureau with any information about a cause. A Florida International University student was among the fatalities, and several construction workers were among the 10 people injured. One person died at a hospital, and Perez said five bodies were located with the help of cameras but not yet retrieved from vehicles crushed under the immense slab. No identities have been released. “We’re not even going to talk numbers anymore because we expect to find other individuals down there,” Perez said. Miami-Dade Mayor Carlos Gimenez said crews had conducted a “stress test” on the span earlier in the day, and Sen. Marco Rubio tweeted that the engineering firm involved had ordered the tightening of cables that had become loosened. “They were being tightened when it collapsed,” Rubio said on Twitter Thursday night. What was the bridge needed for? When finished, the bridge would have been supported from above, with a tall, off-center tower and cables attached to the walkway. That tower had not yet been installed, and it was unclear what builders were using as temporary supports. Andy Herman, a bridge engineer and former president of the American Society of Civil Engineers, told The Associated Press that its so-called “accelerated bridge construction” has been used for years without problems. The school has long been interested in this kind of bridge design; in 2010, it opened an Accelerated Bridge Construction Center to “provide the transportation industry with the tools needed to effectively and economically utilize the principles of ABC to enhance mobility and safety, and produce safe, environmentally friendly, long-lasting bridges,” according to the university website. The project was a collaboration between MCM Construction, a Miami-based contractor, and Figg Bridge Design, based in Tallahassee. Figg is responsible for the iconic Sunshine Skyway Bridge across Tampa Bay. The FIU community, along with Sweetwater and county officials, held a “bridge watch party” on March 10 when the span was lifted from its temporary supports, rotated 90 degrees and lowered into what was supposed to be its permanent position. Both companies have been involved in bridge collapses before. FIGG was fined in 2012 after a section of a bridge it was building in Virginia crashed onto railroad tracks and injured several workers, according to a story in The Virginian-Pilot. MCM, meanwhile, was accused of substandard work in a lawsuit filed this month by a worker injured when a makeshift bridge MCM built at Fort Lauderdale International Airport collapsed under his weight. Another dispute resulted in a $143,000 judgment against MCM over an “arguable collapse” at a Miami-Dade bridge project. A review of OSHA records, meanwhile, shows MCM has been fined for 11 safety violations in the past five years totaling more than $50,000 after complaints involving its Florida work sites. Both companies expressed condolences for the victims and promised cooperation with investigators.